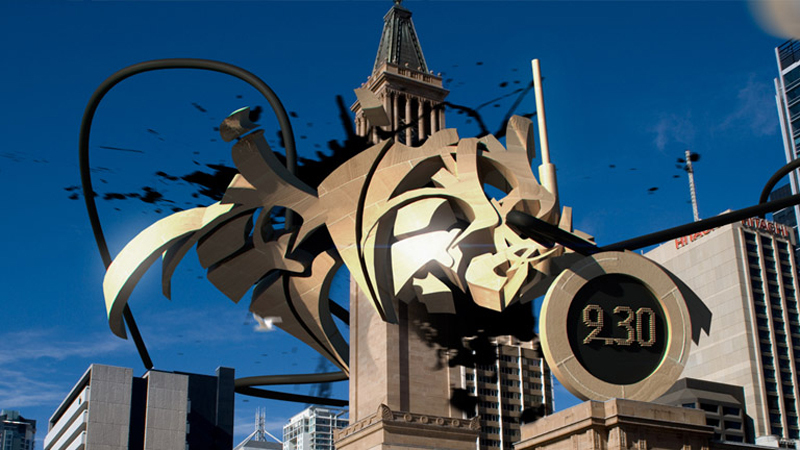 Maximizing the contrast between old and new, this advanced piece of digital graffiti blurs the lines between reality and fiction. The work of the artist wraps around the tower and bleeds out across the surrounding architecture. Consistent colours and textures are used to make this a seamless addition to Brisbane’s city hall. We can only assume this impressive work was named after the artist, who was commissioned to create it in Wimbledon, London. This piece has not been digitally enhanced and instead has relied entirely upon the eye of the artist to create an incredible design that seems to pop off the wall. The colours used add a softness to the solid, jagged design, which is beautifully placed on an otherwise nondescript white wall. As the name suggests, the star of this digital work is the sky, which features what is either a sunrise or sunset. The design imposed on top of it manages to enhance the sky rather than overwhelm it. 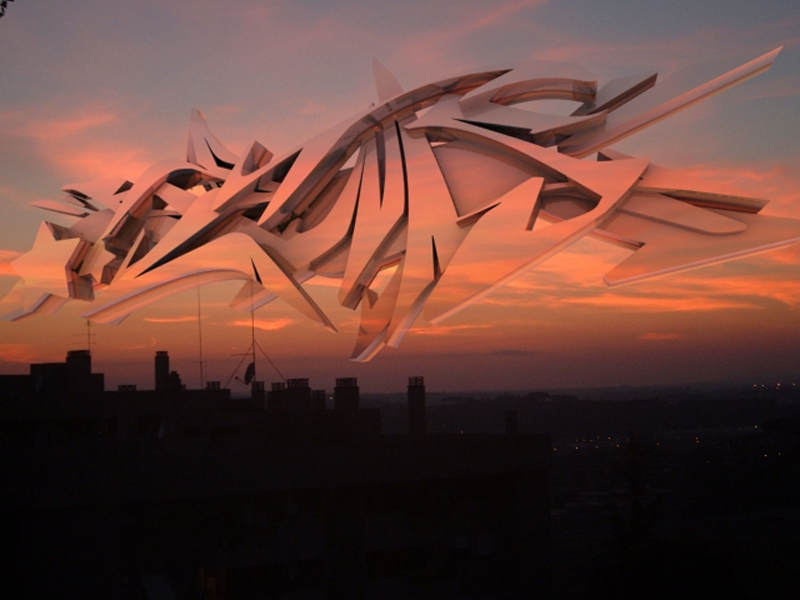 The angular design of the graffiti is in stark contrast to the soothing blend of the sky, while the structures that seem to tether it to the cityscape provide a visual bridge between the silhouettes of the buildings and the artist’s enhancement. 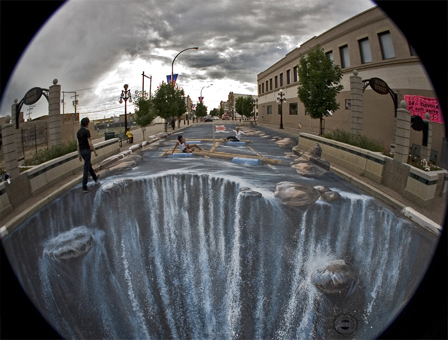 Not all 3D graffiti is epic and detached from humanity, as this example shows. The artist has used perspective to create his own likeness in chalk on the street. It calls to mind the optical illusion type work of the artist Escher, especially as in the foreground the real beer is placed in front of the drawn man, while the drawn beer has been illustrated to appear in front of the real man. 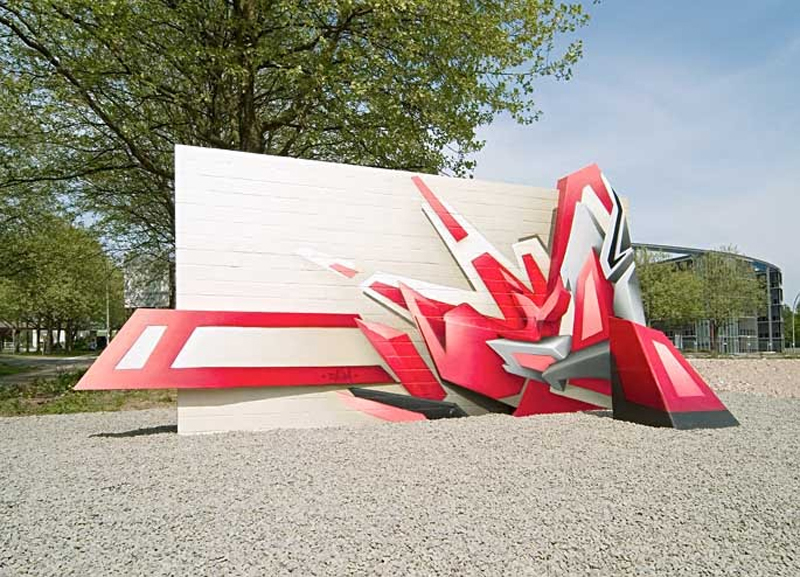 Based in Hamburg, Germany, ‘Die Mauersprengung’ is a 3D graffiti sculpture that has been created by the artist Mirko Reisser. Being a sculpture it has the capacity to depict perceived 3D alongside actual solid three-dimensional shapes. These jutting shapes look to be escaping from the flat brick wall, which is adorned with illustrated forms and colours that boast perfect cohesion. 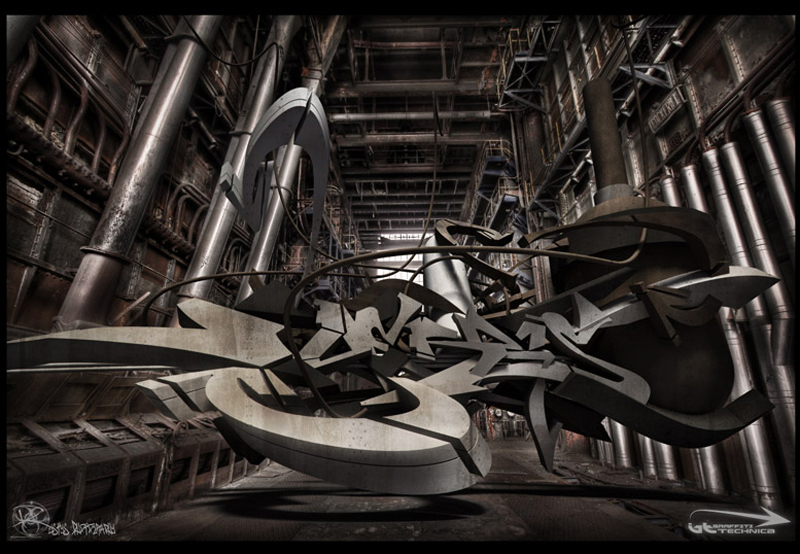 This collaboration between GT and Rusty’s Photography makes the most of both of their talents, to create a massively mechanical-looking piece within an archetypal industrial space. The lighting techniques used deliver an immense cohesion, bringing a cool dinginess to the interior of the abandoned building. 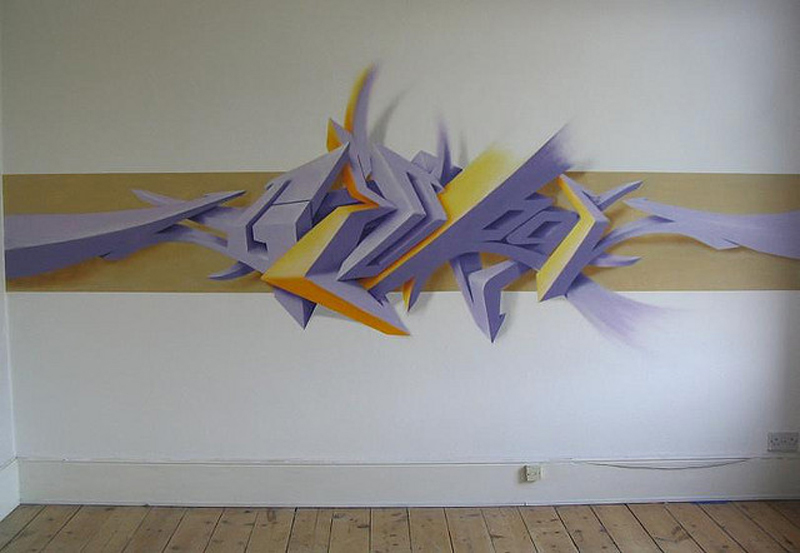 The warped perspective of the photo provides a dynamic backdrop for the graffiti, which almost seems to haunt the space like an evil spirit. The juxtaposition of the rural and the urban here is really striking and somehow creates an image of what a utopian future might look like. The digitally created work within the naturalistic composition is mechanical looking without being too industrial. Thanks to the crisp lines and sharp angles it has a pleasingly sanitary look to it and the use of perspective makes you feel as if you are positioned within the machinery as well as the surrounding landscape. I hope you enjoyed this post, please feel free to chime in and leave a comment below! The designs are just awesome! I almost loved all the designs. The Riverstreet river is the awesome 3D design. Thanks for sharing your valuable information. to make people aware of my work. 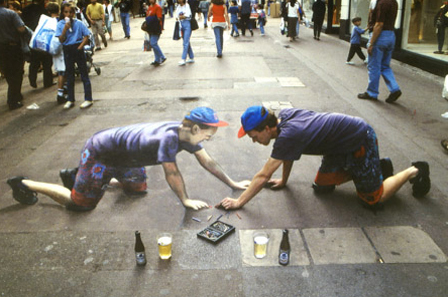 Its not quite as good as this and would love to see one being created in real life! Me and my friend is always prefer to use this web page because there given information was really effective from help windows 10 all the issue in free of cost, i am sure it will be very helpful for everyone.